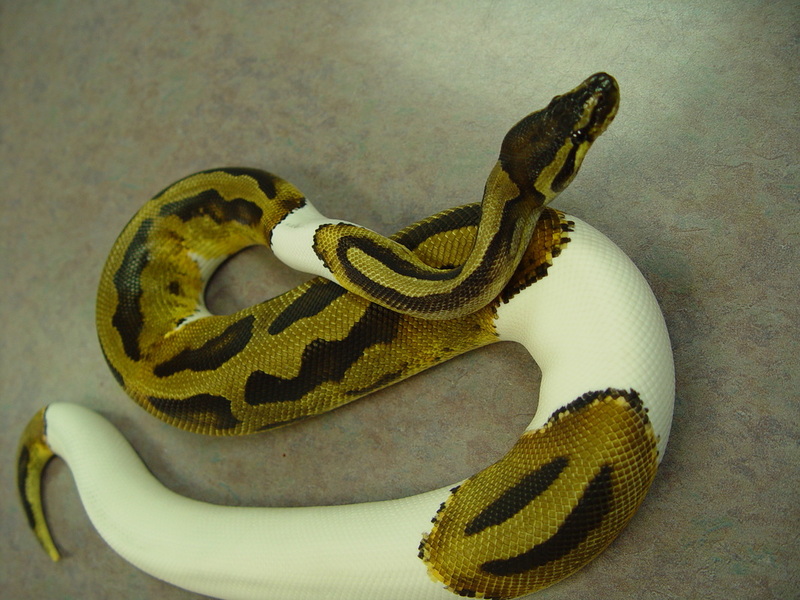 Due to the moderate size and relatively easy going temperament of this species, the Ball python also called the Royal python, has become one of the most popular snakes, if not reptiles, in the pet industry. 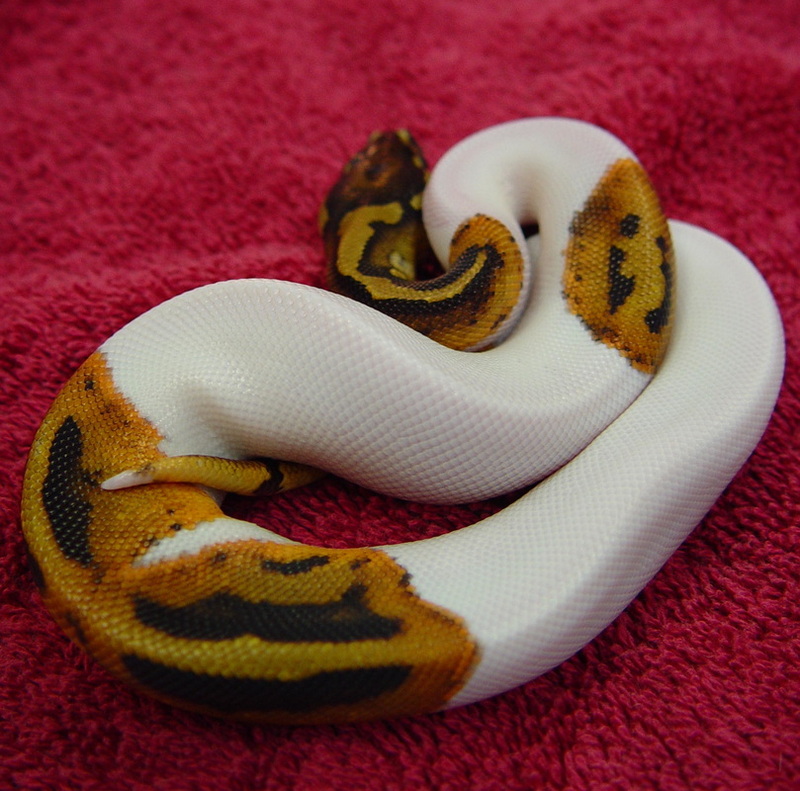 The variation of color and pattern (called, morphs) created by selective breeding in the reptile industry has only helped to rocket their popularity. Ball pythons typically grow between 2-5 feet (6 feet is not uncommon anymore) in length and live 20-30 years with good husbandry. This slender necked but stocky bodied snake is generally identified as tan blobs on a dark brown or black background with white. Typically, the belly is white with or without darker speckled patterns. This is normal for "wild" coloration or "normal". Even though these snakes are technically considered part of the "giant snake" category they are an exceptional snake for those that want the all the features of a python but without the intimidating length. Ball pythons are found throughout western and central Africa with most of the populations concentrated in Ghana, the Ivory Coast, Ghana, and Togo. Generally, these snakes are found in the savannah grasslands and termite mounds (where they frequently hide to shed and escape oppressive heat). Cultivated areas also house large amounts of these harmless serpents as the rodent population is generally large. In its natural territory they are both revered as deities and slaughtered on sight as "venomous" snakes. In Ghana, this serpent is worshiped and even protected. Throughout its natural habitat, these snakes are captured for the meat trade, the pet trade, and even the leather industry. There are many different ways to keep Ball pythons, as with any snake. These primarily terrestrial snakes require more floor space in their cages. Adults can be housed in Neodesha, large plastic containers, and vision cages. Vision cages are the best for monitoring, humidity support, and ample room for maneuvering. Adults can also be kept in a minimum 30 gallon tank but larger is always better with these snakes. Custom enclosures are encouraged and should be at least 3 feet long, 2 feet wide, and 18 inches high. Hatchlings and very young snakes tend to do better in smaller areas such as 10-20 gallon tanks or plastic shoe/sweater boxes with appropriate ventilation. Ventilation can be added to plastic enclosures via a soldering iron or a drill. The ambient temperature in the enclosure is more consistent with what people believe to be a temperate snake than a tropical snake. The temperatures should range from 82-88 °F with a basking spot maintained at 88-92°F. Any higher than 92°F and these snakes develop serious health issues and can die. These temperatures should be maintained with a thermostat and monitored with two thermometers ideally. One thermometer should be placed on the warm end an inch above the substrate and the other an inch above the substrate on the cool end of the enclosure. Under tank heaters, heat cable (outside the enclosure not in the enclosure), heat tape, and ceramic heat emitters can all be utilized to maintain air temperature. Humidity should be maintained at 50-60% to keep this species healthy as they do poorly in low humidity. Ball pythons in shed should be offered a higher humidity around 70% to ensure that the shed is complete and the spectacles are not retained. Cage accessories should consist of at least one hide box in the enclosure. Hides can be as simple as a half a flower pot, half log, or as complicated as a rock structure (make sure it’s well anchored). Low branches for climbing are encouraged for this species especially when they are young and are wonderful for enrichment. The addition of hay or dried leaves offers new scents for the snake to explore. Also, adjusting the cage furnishings once in a while is recommended for enrichment. In the wild, these snakes feed primarily on small rodents especially Spiny mice. In captivity however, most are fed mice and smaller rats although the largest of them have been known to eat large rats. The prey should be humanely euthanized using acceptable methods. Frozen prey should be used within six months of freezing. A separate feeding cage is recommended so the snake associates the cage with feeding and not your hand. 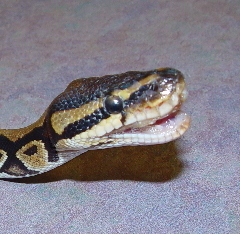 Ball pythons are nighttime feeders. It is highly recommended to feed only pre-killed prey as live prey can severely injure or kill a snake. Chicago Exotics recommends feeding properly thawed frozen rodents. Young snakes are generally fed semi adult mice to small young rats ("crawlers") every 5-7 days. Generally, they should be fed prey items no larger than their girth at mid-body. Juveniles should be fed the appropriate sized rodent (s) weekly. As they reach adulthood it is acceptable to decrease the feeding interval to every 10-14 days. Adults are fed small to large rats every 7-14 days to maintain a healthy weight. These snakes can become obese if their intake isn’t monitored. Sexing can easily be accomplished by probing. Juveniles may be sexed also by manual eversion of the hemipenes. 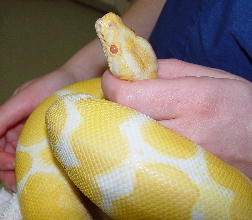 Either technique should be performed by an experienced person or reptile veterinarian, since poor technique may result in injury. Generally, females probe a distance of 2-4 subcaudal scales and males 8 or more. Males have larger cloacal spurs and longer tails than females. Sexual maturity occurs between 2 and 4 years of age, if appropriately fed and maintained. Breeders begin cycling in either mid-September through mid-November. Eggs are usually laid from mid-February through beginning of April. 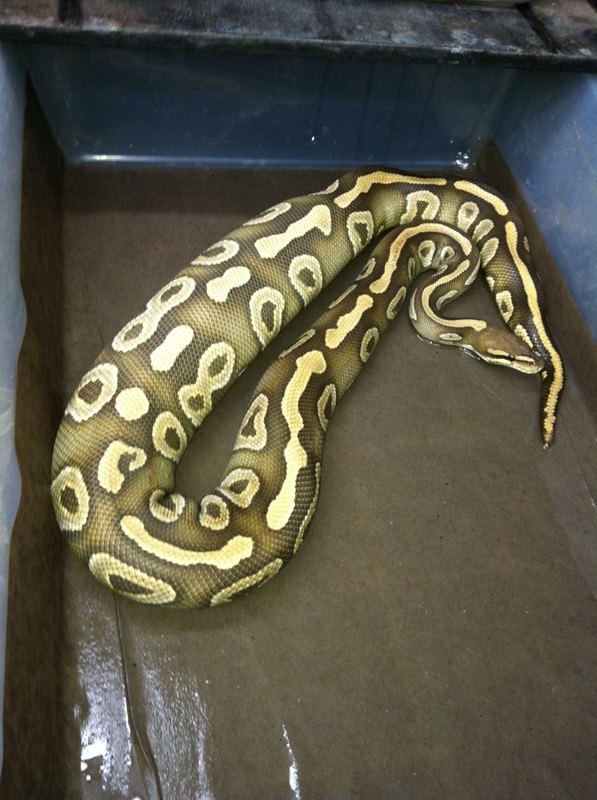 Ball Pythons are not fed for two weeks prior to cooling. 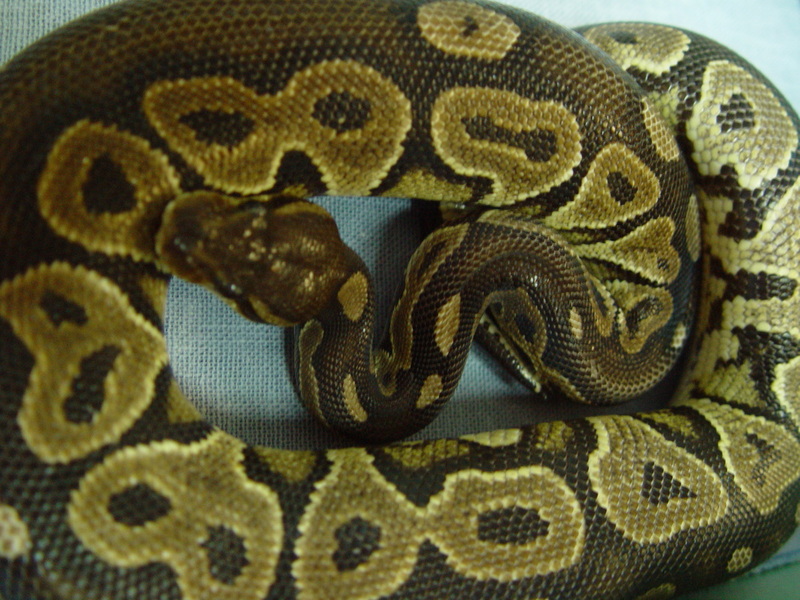 The temperature is gradually decreased to 75 F. Some breeders keep the snakes at their preferred daytime high temperature during this period, but drop the nighttime low to 75 F. It is possible to utilize a combination of these two techniques. Monitor the snakes carefully for evidence of respiratory disease. Respiratory infection is most likely if the snakes are not provided a basking spot in their preferred temperature range for at least part of the day and, because of this, the first technique is not recommended. Depending upon the breeder, males are introduced to females either at the beginning of, during, or after cycling. Active courtship precedes copulation. Eggs are usually laid in burrows or well placed sweater boxes with moistened vermiculite and peat moss inside. Usual clutch size is six or seven eggs. Incubation time is about three months. Good husbandry is the best way to prevent many problems. 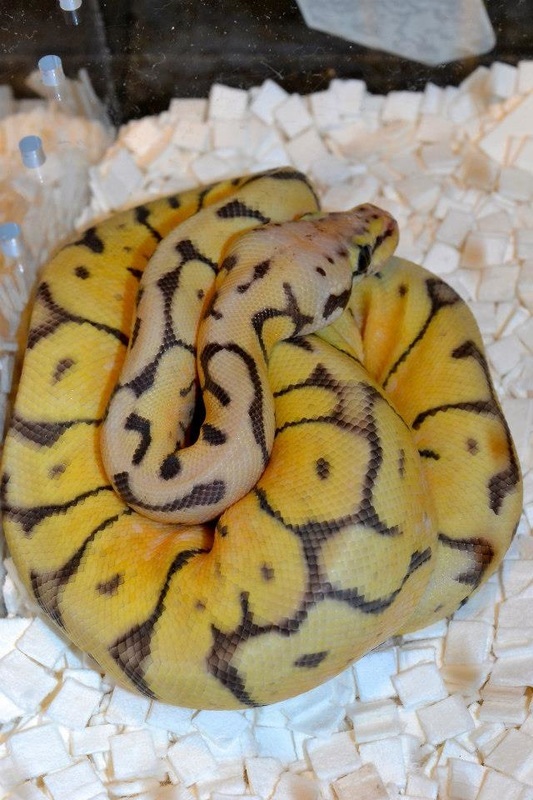 Ball Pythons should be quarantines for at least three to six months before being added to an established collection. 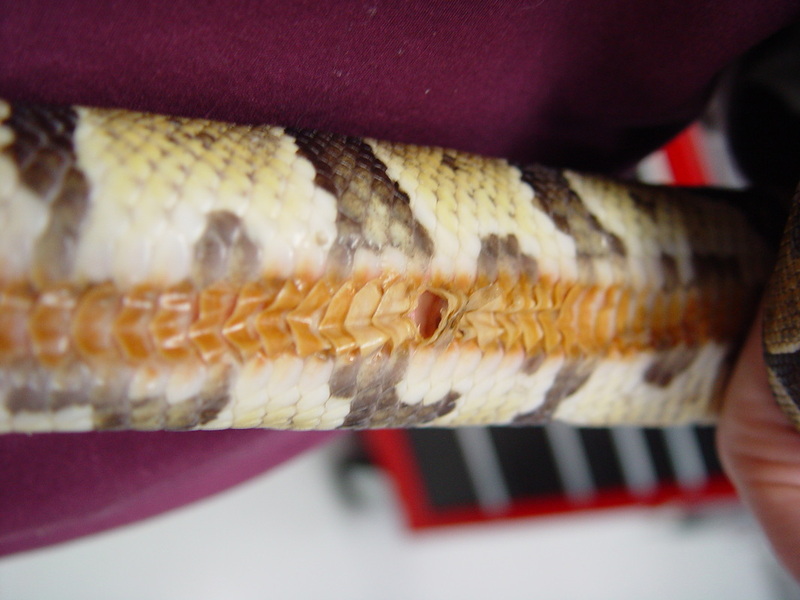 Respiratory tract disease is very common in captive snakes. Difficulty breathing, discharge from the mouth, and wheezing are common signs associated with respiratory tract disease. Pictured to the left is a snake with horrible stomatitis and pneumonia. You can see the inflammatory debris crusted in his mouth. The head up, open mouth position is typical for a severely compromised patient. This snake needs help ASAP.